Description: Fashion-forward comfort in a super-soft jersey you’ll want to sleep in. 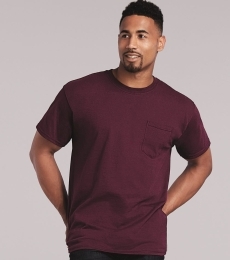 Key Features: •	30-single 100% combed and ring-spun cotton •	4.2-oz. with a Tear Away Tag making re-branding easy! Note: Athletic Heather is 90% combed and ring-spun cotton/10% poly. Other Heather colors are 52% combed and ring-spun cotton/48% poly.